When Iris Paterson joined Aberdeen University in 1964 as a house table maid, she was only meant to stay in the post for three months. But half a century on – and counting – the great-grandmother remains a dedicated member of the team, manning the reception at the university’s Hub and helping out any youngster in need. Yesterday, Mrs Paterson – affectionately known as Mrs P to generations of students – received a special long-service achievement award to mark her outstanding dedication to the establishment. Pro-Chancellor, Professor Iain Torrance, said that if anyone was to be described as a “legend in their own lifetime”, it was her. She was also described as a “friend, confidante and dispenser of wisdom”, who carried out all her duties with a “twinkling smile”. “Celebrating 50 years of supporting anxious freshers through those first few overwhelming weeks is unlikely to persuade Mrs P to hang up her smart modern black uniform polo and trousers anytime soon,” said Mr Torrance. 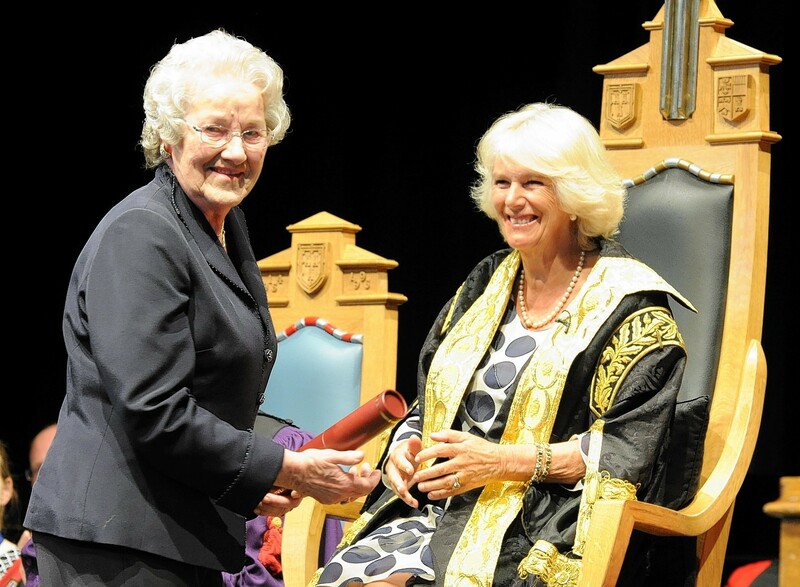 As Mrs Paterson, who was born and brought up in Aberdeen, was awarded her scroll by the Duchess of Rothesay on stage yesterday, students stamped their feet and gave the loudest cheer of the day. Afterwards she said she was incredibly proud to be recognised for the job she loves. She spent 36 years working at Crombie Hall, seven at Johnston Hall and the last four at the Hub, where students go when they need careers advice or information on finances and accommodation. Mr Paterson said she loved all the students she helps and has no intention of stopping her work any time soon. “They help keep me young,” she said.